The International Symposium on Medical Data Analysis is an important - riodical opportunity to exchange ideas and ?rst-hand experiences with groups interested in the medical applications of innovative hardware and software tools. 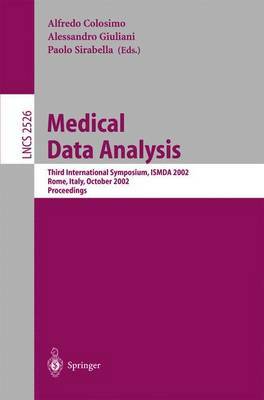 The massive information available through continuous improvements in the various modeling approaches to Medical Data Analysis is re?ected in the - sults, dealing with quite di?erent topics, presented during the Third Edition of the Symposium (ISMDA 2002). They have been grouped into the following four categories: (1) Data Mining and Decision Support Systems; (2) Medical Informatics and Modeling; (3) Time-Series Analysis; and (4) Medical Imaging. In setting up the symposium program we tried to avoid, even with the sho- age of time, parallel sessions. Thus, all participants had the chance to catch all the oral presentations, and we hope that this third proceedings volume will extend this chance also to non-participants. As for the previous volumes, it c- tains extensive up-to-date chapters on Medical Data Analysis, packed with ideas, suggestions, and solutions to many problems typical of this ?eld.